Christian Louboutin's distinctive and high-fashion lacquered red sole shoes have been in the news frequently in the last month. A war is being waged over these famous red-soles.... one battle is being played out at our ports while the other is being played out in our courtrooms. Look closely at the picture about and you'll notice the famous CBP green tape just below those famous red soles. 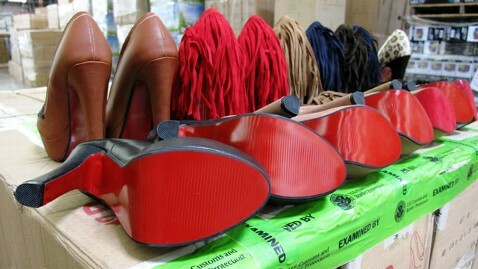 On August 14, CBP import specialists and officers assigned to the Los Angeles/Long Beach seaport seized a total of five shipments arriving from China containing 20,457 pairs of ladies footwear, in violation of the Christian Louboutin trademark, with a domestic value of $57,490 and an estimated manufacturer’s suggested retail price of $18 million. CBP's first hint that something was wrong with the shipment - it was coming from China instead of Italy, where the legitimate Louboutins are produced. CBP is not the only enforcer of Louboutin's trademark. After Louboutin entered into a major legal battle with its competitor, Yves St. Laurent (YSL), the district court determined that the red-sole mark was invalid because a "monopoly on the color red would impermissibly hinder competition amongst other participants." This was mostly overturned just this week, as the U.S. Court of Appeals for the Second Circuit found that Louboutin had the right to trademark its red soles, as long as the color of the sole contrasted with the rest of the shoe. The appellate court held that the doctrine of aesthetic functionality is a valid defense in the Second Circuit in cases “where protection of the mark significantly undermines competitors’ ability to compete in the relevant market” (emphasis in original). A mark is aesthetically functional if granting exclusive protection to the feature “would put competitors at a significant non-reputation-related disadvantage,” citing TrafFix Devices, Inc. v. Marketing Displays, Inc., 532 U.S. 23, 32-33 (2001).The appellate court concluded that the red, lacquered outsole had acquired limited secondary meaning "as a distinctive symbol that identifies the Louboutin brand." The greatest lesson from this saga, for all producers of distinctive goods, is the importance of working with an attorney to register your trademark with the U.S.P.T.O. and then record those registered marks with CBP’s Intellectual Property Rights e-Recordation system. Christian Louboutin has U.S. Customs and Border Protection policing its brand from Chinese counterfeiters at our country's borders, while the Federal Court system protects its product's distinctiveness from legitimate big-pocket competitors. This kind of protection is invaluable for any manufacturer, designer, producer, or importer - just follow the saga of the red-sole shoes. Export Compliance Bootcamp - Join Us!